When you mark a habit as finished the app makes a great tone and celebrates the number if your streak! Sometimes I feel like my life is the movie “Memento.” The character had a memory problem so everyday he tattooed notes all over himself as he searched for his wife’s killer. It’s a strange movie but it might as well be a document drama about my life. As an educator and parent, I often feel like the man from Memento. I’m responding to a hundred requests in a day and by the end of the day I can’t even remember my own name. I know I keep harping about the Chains.cc app. I promise you that I’m not receiving kickbacks. (Though I would love it if this blog was self-sustaining.). Chains.cc just works because I need something to remind myself of the things I want to accomplish for myself: learn to play guitar, write, speak or understand a few languages, be semi-physically and financially fit, and become a better librarian. After 69 days I can honestly say the chain apps is starting to work for me. The way it works is simple. If I perform a mini habit I check the habit off on the app. When I do this it tells me how long my chain is. If I turn my phone on it’s side the app gives me a visual of how long I’ve sustained each habit. Practiticing guitar at least two minutes a day extends my fretboard. Writing at least five minutes a day extends an ongoing bookshelf. At least five minutes a day extends my running track. It’s gotten to the point where I feel so rewarded by extending my streak that I dread having a gap in my picture. So sometimes I find myself doing five minutes of stretching rather than having a gap in exercise streak. Because I keep my tracked habits to a minimum. There is no forgetting. The great thing is that I am getting results. I am not ripped but my muscles are more toned. 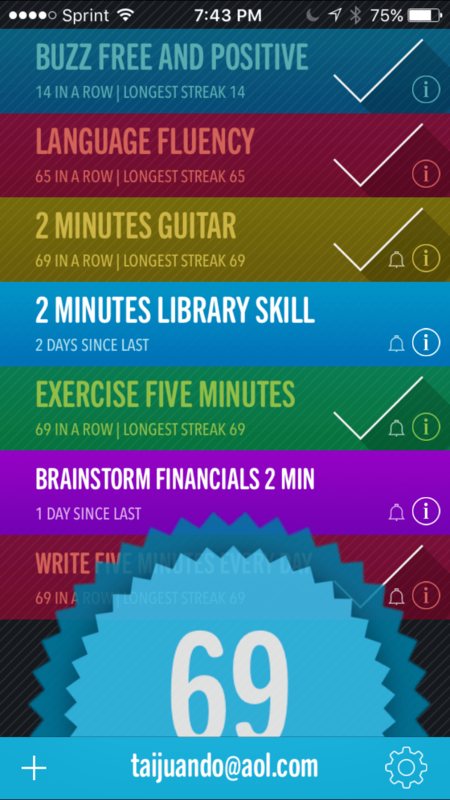 Every other day I use the Zen Challenge app to do more push ups. Currently I am up to 200. I’m learning more guitar and I’m blogging on a more consistent basis. 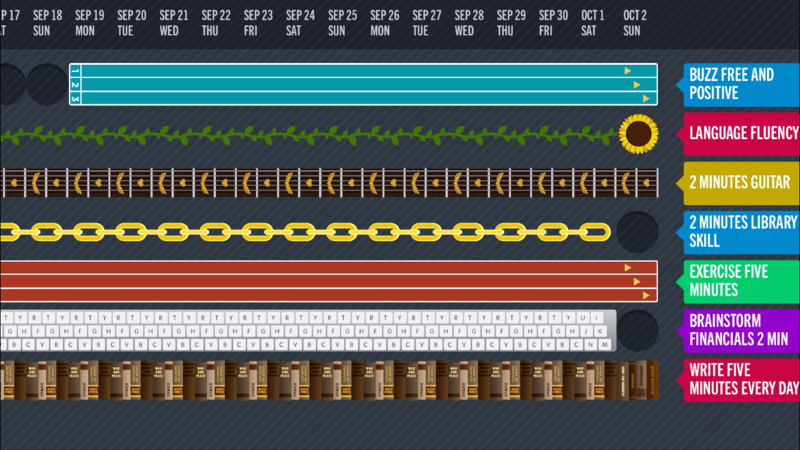 I’m also using the Chain.cc app to work on a negative habit. I was finding that my craft beer hobby left me a little sluggish and also a little fat. I decided to create a “Buzz Free and Positive” habit where I give myself credit for not having a beer. After thirty days, I will celebrate with a craft beer. Or two. The choice is binary. Either I did the habit that day or I didn’t. But in the end I think the biggest benefit of a simple but colorful app like Chains is that it helps me fight against forgetting. The responsibilities and craziness of the day may threaten to erase good habit building but the app keeps me building every day. Don’t forget to habit.